I've been metal detecting since 1973, and I was voted into the Treasure Hunters' Hall of Fame in 1999. I've written for several treasure magazines, and I've served as Associate Editor of Treasure Quest magazine. 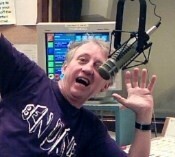 I retired in 2007 after 26 years as a college broadcast instructor and general manager of a college radio station. I'm a Purdue grad with a degree in Broadcasting. I also hold a master's degree in technology, and an FCC First Class Radiotelephone Operator's License (well, held, since broadcast licenses are now obsolete). I'm a licensed ham radio operator (N9XDK), an old-time radio actor, an adult slowpitch softball fanatic, and a sixties music quasi-expert. I do free biweekly podcasts on treasure hunting and softball, and a weekly old-time radio show. And I have a pretty spiffy personal website. So why can't I keep any friends? I'm easy to reach. Click my email link, or write me at 1707 W. Park Ave, Champaign IL 61821, or call me at 217-351-1680 (but please, not after 9 pm Central time - we're a couple of old-time early-to-bed, early-to-rise folks).